My father died yesterday, twenty-one months after his diagnosis with pancreatic cancer. We all knew what was coming: impossibly, both of his parents died of the same disease. I did not want to write about this. What needed saying has been said. But there will be no marker for his scattered ashes. As I am a writer I owe him the service of an epitaph, to say: Look stranger, there lived a man, his name was Anthony Peter Rodriguez, Junior, he served his country, he had three children, two grandchildren, he never lost a friend. 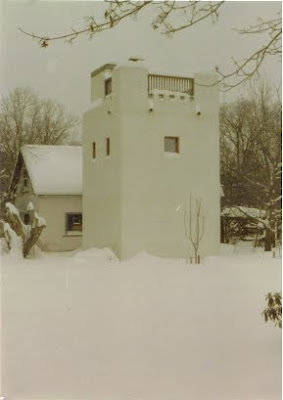 Around the time I was born my father built a tower. He was tower-minded, he knew Jung’s tower, Yeats’, Montaigne’s, he stood once on the tower in Jericho, ten thousand years old. He mixed concrete and lay rebar and bonded block until his tower stood three stories tall and bomb shelter strong. Our names and our handprints in the concrete. A few years later, we moved away. I wasn’t with him when he missed it, but I went with him to check that it was gone. Diamond saws had cut it apart to open a new owner’s view. He had hoped to revisit it when he was ninety. He had hoped it would be a legacy for him. Maybe here I can give him a monument more lasting.